Originally published under the title, "Did U.S. Policy Allow Ramadi to Fall?" The fall of Ramadi to the fighters of the Islamic State is a disaster for the Iraqi government of Prime Minister Haider al-Abadi. The taking of the city brings IS to just over 60 miles from Baghdad. In addition to showcasing the low caliber of the Iraqi security forces, the events surrounding the fall of the city lay bare the contradictions at the heart of Western policy in Iraq. Prime Minister Abadi had ordered the garrison in Ramadi to stand firm. He hoped to see a successful stand in the city as a prelude to a government retaking of Anbar province, over half of which is still in IS hands. But in a manner reminiscent of the fall of Mosul in June 2014, Iraqi security forces ignored orders to defend Ramadi, and fled eastwards to the neighboring town of Khalidiyeh. This left Ramadi to the tender mercies of the fighters of the Islamic State, who have reportedly since slaughtered at least 500 people. It is important to note that even U.S. airstrikes were not sufficient to prevent the debacle. As of now, Shia militias are heading for the city's outskirts. A militia-led counterattack is expected in the coming days. A further advance eastwards by the Sunni jihadis, at least in the immediate future, is unlikely. So what is behind the failure of the Iraqi security forces and the continued advance of the jihadis? On the simplest level, the greater motivation and determination of the IS fighters explains their continued successes against the Iraqis. The jihadis are all volunteers. Not all of them are highly skilled fighters, but their level of motivation is correspondingly very high. The White House is determined to relate to the government of Haider al-Abadi as the sole authority in Iraq. By contrast, Iraqi soldiers are often serving far from home, defending communities for whom they have little concern. Most joined the army for the salary. Their unwillingness to engage against the murderous jihadis of the Islamic State is not hard to understand or explain. However, this problem has now been apparent for nearly a year, ever since the Sunni jihadis first crashed across the border from Syria last June. So why has it not been addressed? The blame for this cannot be placed at the feet of low ranking Iraqi soldiers. The blame lies at the policymaking level. The United States is committed to the territorial unity of Iraq. It therefore is determined to relate to the government of Haider al-Abadi as the sole authority in the country. The problem with this stance is two-fold. Firstly, it precludes providing arms directly to the elements who are most willing to use them against the Islamic State (namely, the Kurdish Peshmerga and further south, the elements among the Sunni tribes whom the U.S. aided during the "surge" in the 2006-2007 period). In the north, this has not prevented the Kurds from successfully defending the area west of Erbil (with the vital assistance of coalition air power). But it has served to keep the Kurds militarily dependent on the coalition, thus reducing the possibility of their making a bid for independence from Baghdad in the immediate future. The Obama administration refuses to directly arm pro-Western elements in Iraq most willing to fight IS. Secondly, and more importantly, the U.S. commitment to the territorial unity of Iraq is leading to a willful blindness regarding the actual nature of the government in Baghdad and its true sources of strength and support. 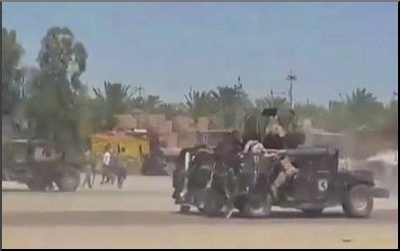 The supposedly legitimate armed forces of Baghdad are, as has been witnessed again in Ramadi, not fit for the purpose. The true defenders of Baghdad and of the government are right now heading toward Ramadi. They are the forces of the "Hashd al-Shaabi" (popular mobilization). They are the Shia militias, supported by Iran. These militias are the wall behind which the Amadi government shelters. The West insists on maintaining the illusion that the government in Baghdad is something other than a Shia sectarian-dominated entity in the process of entering a de facto military alliance with the Iranians. This stubbornness is producing the current absurd situation in which Western air power is being used in support of Shia Islamism. 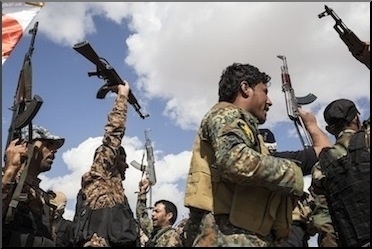 American hesitation to aid Kurdish and tribal Sunni forces has left the field to Iranian-backed Shia militiamen, seen here after their recapture of Tikrit in March. It is important to understand that this is not taking place because there is no other option for stopping the advance of the Islamic State. There is another, more effective option: direct aid to the Kurds, and to the Sunni tribes further south. This support of Shia Islamism is taking place because of the conviction in Western capitals — most importantly, of course, Washington, D.C. — that the advance of Iran and the building of Iranian strength in Lebanon and in the collapsed states of Iraq and Syria is not a phenomenon to be prevented. Rather, Western capitals believe that growing Iranian influence can be accommodated and perhaps even allied with. This conviction combined with the desire to maintain the fictions of "Iraq" and "Syria" are the foundations of current policy. For these reasons, in the coming days we will witness U.S. and Western air power, astonishingly, supporting Shia Islamist militants as they battle with Sunni Islamist militants. Meanwhile, overtly pro-Western forces further north lack arms. The Islamic State just took Ramadi. In Western capitals where Middle East policy is made, folly is engaged on a similarly triumphant march. Jonathan Spyer is Director of the Rubin Center for Research in International Affairs and a fellow at the Middle East Forum. He is the author of The Transforming Fire: The Rise of the Israel-Islamist Conflict (Continuum, 2011).